If you guys follow me on Instagram, you may have noticed that last week I was shooting scenes for a TV show called The Foodie List. It’s a Canadian food and travel show that will air in the Travel Network in Canada, France, Asia – the producers go to different cities across the world, and then they feature local food experts to talk about that city’s best eats. I was one of the foodies for Boston (along with my pals Molly, Fiona, and Dan). Our episode will air later this year in September and of course I’ll post a link to share with everyone! I was a nervous wreck the few days leading up to the show. While I am a true extrovert and feel quite comfortable speaking in front of a crowd, I don’t really have any substantial TV experience so I was pretty scared to get in front of a video camera. My friends were very encouraging and supportive, but another thing that helped me feel more at ease was FaceTime-ing with my parents every night, and going over every little detail with my mom. My mom bolstered my confidence with each phone call, she laughed at my jokes, gave me fashion advice, lent me her fine jewelry. She reminded me how much I already know about the restaurant scene in Boston, how I can use my Journalism background to help me feel more prepared, how I can be a natural fit for a food and travel show. 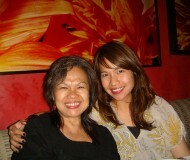 After every conversation with my mom, I felt strong and smart and funny and beautiful. Heck, I felt like I could conquer the world! But I guess that’s what my mom has been doing my entire life. She and my dad have given me and my sisters everything we needed and wanted and more. My mom is my role model every time I go after something I want, every time I do something new and scary, every time I travel to a new place and eat something delicious and see something wonderful and have an actual adventure. My mom believes in me so much, and she reminds me that I can do anything I put my heart into. Because of her, I believe it, too. She has always encouraged me to go after my goals, she has inspired me to be a better person, and she sets a magnificent example of being empathetic and generous. My mom and I share a lot of personality traits, and we also share a deep appreciation for comfort food. We’re both not scared of fat and cheese and meat; we embrace it. True fact: my mom is my number one preferred dining companion when eating at a churrascaria (Brazilian steakhouse). Every time she is in Boston, we have the most delightful time eating at new restaurants and going back to the ones we’ve been frequenting for years. She also makes me some of my most favorite meals, which includes barbecue ribs and her surf and turf pasta sauce. This is My Mom’s Pasta Sauce. This is unlike any other pasta sauce I have ever tasted. 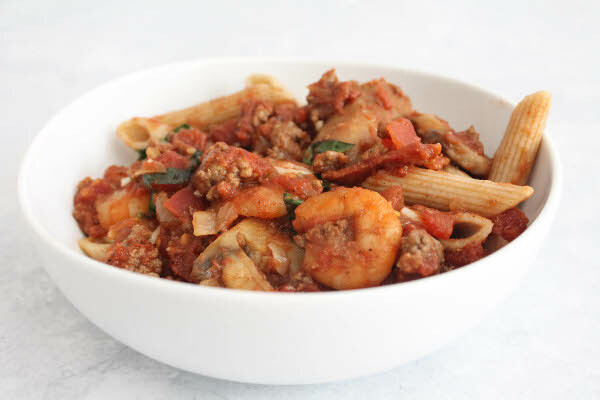 It’s an epic meat sauce, but it’s also more like a surf and turf because of the addition of shrimp. There’s ground beef, bacon, spicy Italian sausage, mushrooms, shrimp, capers, a big glug of wine. My mom likes to serve it with penne, so that the sauce can get into the little tubes, but a flat wide pasta would also work, like pappardelle or fettuccine. 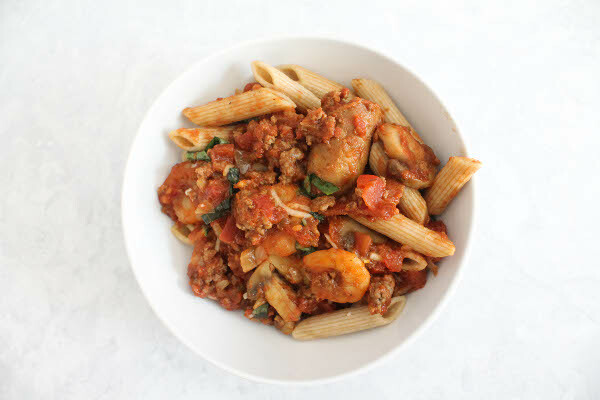 In spite of the many different kinds of meat, this pasta sauce is actually very easy to make and only needs one pot (plus another for the pasta if you’re making it at the same time). I’ve never made this myself – I always wait for my mom to make it for me – but this is too great not to share with the world so I asked my mom for her recipe and recreated it to post here. And also because it is Mother’s Day this weekend and my mom deserves all the credit and gratitude and adoration I feel for her. Each bite is meaty and smoky and spicy. It’s a filling dish, and definitely my comfort food. It’s a meat lover’s special, made even better with shrimp. It’s my mom’s labor of love, from her to me to you. Cook penne according to package directions. Rinse pasta with cool water; set aside. 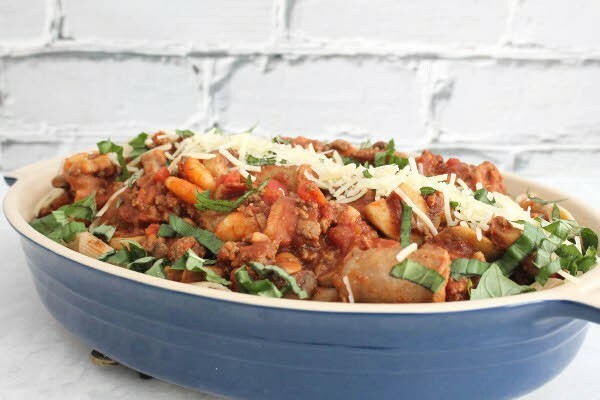 In a large dutch oven or heavy bottomed skillet, add the ground beef, a generous pinch of salt, and about 1/4 cup water. Turn the heat on to medium-high heat and let the ground beef cook, until the water evaporates and the beef begins to sweat and release oils. Remove from pan and set aside. Add the bacon to the pan and cook until beginning to crisp. Remove from pan and set aside. Drain oil except for a tablespoon. Add the Italian sausage to the pan and cook until browned. Remove and set aside. Lower heat to medium. Add the onions and saute until softened, about five minutes. Add garlic and saute until fragrant, about two minutes. Add mushrooms and olive oil, and cook until mushrooms are browned, about 10 minutes. Add shrimp to the pan and cook for only a minute or so. 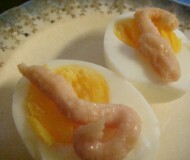 If you are using raw shrimp, cook until shrimp is pink. Add back the ground beef, bacon, and Italian sausage. Add the crushed tomatoes, capers, red wine, Worcestershire sauce, and Tabasco. Lower heat to medium-low and simmer for 20 minutes, until sauce thickens and your house smells like an Italian restaurant. Serve over pasta and garnish with fresh basil leaves and Parmesan cheese. 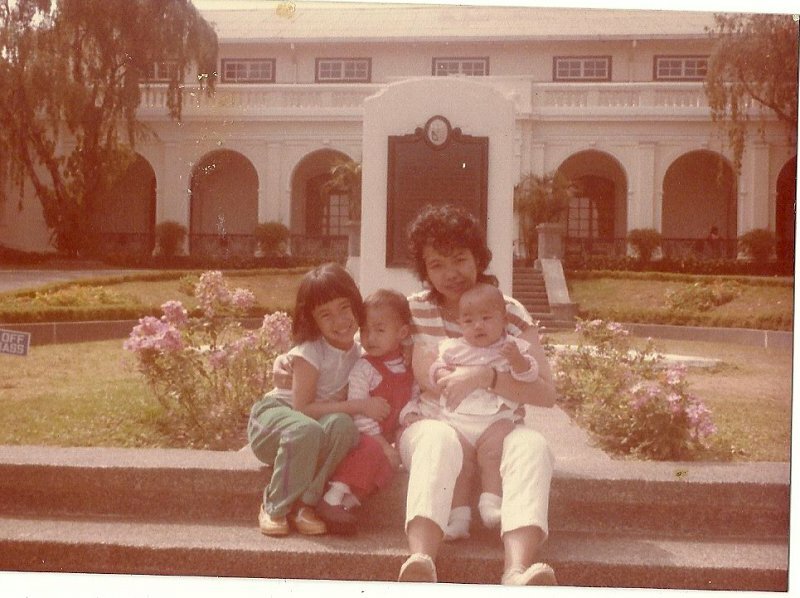 Here’s a picture of my mom with rockstar hair in the eighties, with me (on the left) and my two sisters. Proof that I’ve been sporting bangs and the head tilt for the camera since I was a little girl. Full fashion credit goes to my mom, of course. Thank you, Mommy, for always feeding my confidence and my appetite, and encouraging me to live with a full and happy heart. I wouldn’t be the person I am today without you. I love you! I had something similar once in a restaurant in Italy. If I remember well it was called Pasta Mare and Monti (which translates to Sea and Mountains): to give the idea that it’s a dish with both fish and meat. BTW loving your mom’s version, looks amazing! Bey, thank you for being my litlle girl always who puts a smile in my heart. Aww this is so sweet! Love your photo with you mom. I miss mine so much! How completely awesome you’re featured on TV. I could never do that – I hate attention and public speaking – I would rather have a root canal! 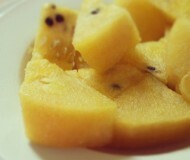 Lovely recipe – with all the wonderful ingredients I love! I am getting misty! I love this tribute to your mom. And for the record, you were a natural on camera! I love the photographic evidence that you have been doing the head tilt since birth! You were the perfect TV personality as well ;) Can’t wait to read your recap of our adventure that week! Moms really are the best – loved reading this post! And how cool about the TV show!! This pasta sauce looks amazinggg. Bianca, what a sweet tribute to your mom. This sauce is seriously making me drool. And you are going to be on TV?!? !/ How exciting for you! Congratulations! This looks heavenly. Hugs to your sweet mom! Ooh Bianca I’m loving the addition of shrimp! The flavour profile of this would be amazing! :D Yay for mum recipes! Aaw, I loved this post. So cool about the TV show! Mom’s really are the best :) This pasta sauce looks amazing! What a wonderful post about your mom. It’s so great that she is such a supportive influence in your life. And I can’t wait to see your episodes… I’m super jealous because that sounds like an awesome experience! Thank you so much, Lauren. Yes it was definitely an amazing experience, and I also can’t wait to see the episodes! What a sweet tribute to your mom, Bianca. I love your Mother’s Day (and Father’s Day) posts. You are so lucky to have such a beautiful mom and such a special relationship with her. It’s just wonderful. Happy Mother’s Day to your very deserving mom! That is one stellar-looking pasta sauce, too. This is such a sweet post Bianca…I love the picture of you mom…too cute! i need to make homemade pasta sauce more often….this sounds wonderful. Moms are really the best!! So glad her pasta sauce is always comforting. I can’t wait to see your episode. Moms are just THE BEST. Hope you had so much fun filming!! 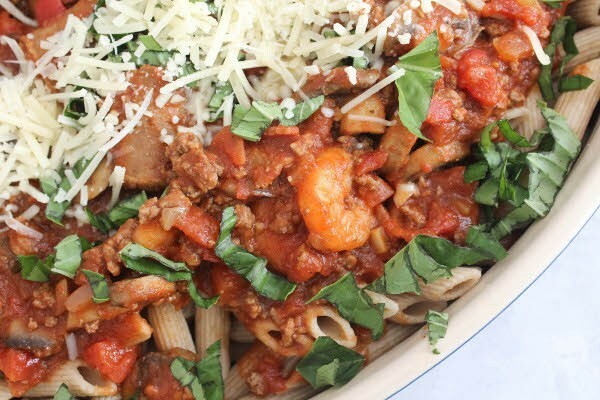 I can totally see why this pasta sauce is a comfort food favorite! Bianca, what a great combination of ingredients! And I agree with you mom — penne is my favorite pasta. Occurred be put returning on medication you can do that helping to relax and just start discussing and he said you know in unwanted concern that you follies total me about a guys who’s dealing with hive_ and uh… it was discovered the same kind of diet perform that’s quite identical way and then medicines for a several decades as well so this creates failures because this is fungus and you know they’ve these aspects for men to . There is a way to spurn some new muscular dimension and durability, which will continue to operate alone or even in conjunction with one of these workouts – and that is a nutritional strategy. Are you prepared to shock your body system into improving just per a week, using diet strategy alone?